The Center for Discovery’s Department of Nourishment Arts (DNA) is at the forefront of promoting food as a critical component of health, healing, and quality of life. So it’s only natural that we align with those who have spearheaded the Slow Food movement, a philosophy that promotes local food systems, biodiversity, and traditional culinary​ practices. Chief of our DNA team, Chef Cesare Casella, was in San Francisco this month where he joined some of the world’s top chefs, ​including Slow Food Founder, Carlo Petrini, at the annual Good Food Awards. 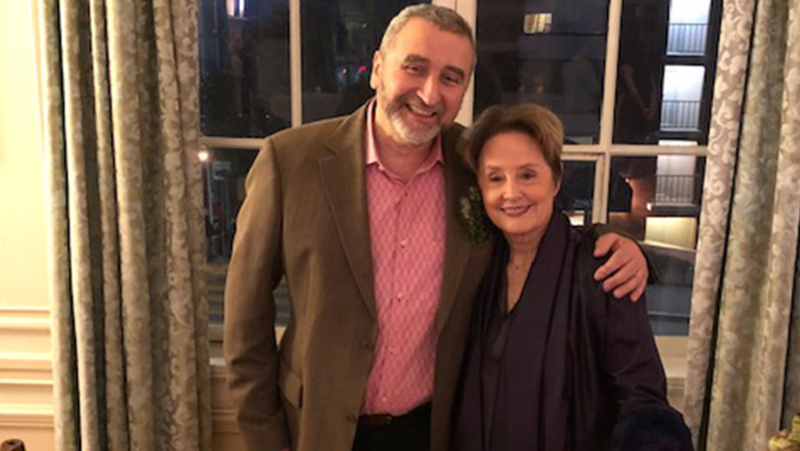 During his trip, Chef Casella was also in San Francisco to support his friend, renowned Chef, Alice Waters of Chez Panisse, a Slow Food movement proponent, who was knighted by the Italian Republic in a ceremony at the Italian Consulate. “How we eat can change the world,” says Chef Waters. We certainly agree and live by that adage every day. When Chef Casella returned from the West Coast back to Hurleyville, NY, we were able to sit down with him to talk about his trip, DNA’s global mission, and why food – a thing that is so essential to life, to health, and to community – should never be an afterthought. Describe your friendship with Alice Waters. Casella: I met Alice in the 1980’s when she came to eat at Vipore, and we soon became friends. When I moved to the US, I started following all of her work. I have a lot of admiration for what she did for American food, and for food in general. Still today, we are close friends and I was very proud to be there at her Italian knighting ceremony. I went because I believe in everything she is doing – both her knowledge and her strength. How does her philosophy on food align with yours and that of TCFD? Aren’t there a lot of similarities between the Slow Food Movement spearheaded by Carlo Petrini and supported by Alice Waters, and what you are doing with DNA? Casella: First of all, Alice and Carlo Petrini are two incredible people who care for food and for people. They have shared their knowledge and have organized people to change the way they think about food around the world. They are truly pioneers who I enjoy spending time with, because at every moment I am learning. With DNA, we respect that knowledge and their philosophy which connects with the work we do here. Slow Food celebrates local food, tradition, biodiversity, and conviviality. We try to incorporate this on every level of what we do, too. They are doing work to bring this thinking and approach to all people, and that is our same, bold mission. What do you tell other chefs about your work at DNA? Casella: I usually start by telling them how TCFD gives me so much energy. It is so inspiring and while sometimes I miss the good days at the restaurant, the work we are doing here is so much more fulfilling. Between the farm, the chefs, and the nutritionists – the work to feed people is all-encompassing and I see it as a fantastic challenge. To have a great team and to do meaningful work – that’s what it’s all about, I truly don’t think there is more you can ask for. Why is it so important to spread the word about the mission of DNA? Casella: The work we do through DNA is incredibly important. Not only for the people we care for directly, but I believe the lessons we teach here can help all people. We have an opportunity to show that our model works. There is a lot of room to educate all people on making good food choices – helping not only to create balance, but to feel more comfortable and energetic in their lives. If there was one piece of advice you would give someone about healthy cooking, what would it be? Casella: Choose the ingredients that smile at you – happy ingredients are great ingredients! Then respect them, have a party – celebrate them. Sometimes the best preparations are also the simplest. Food should be exciting which is why when you choose seasonal ingredients, and you know where they come from (maybe even helping to grow them!) – those are always the most satisfying meals to share. Don’t forget to have FUN! What are you most proud of in all of your years at TCFD? Casella: There is so much. We have a tremendous team that is committed to putting the best food on the table – between the nutritionists, farmers, chefs, and more. I am proud of the team we built and to see that there is always progress – always advancing one step at time. When you look forward, what is your vision for the future of DNA at TCFD? Casella: I see how far this vision has come in just a short amount of time, but we must continue to evolve and grow our vision. We have the opportunity to be a great example of what is possible – changing how people think of food and its link to health and care. I hope we can share our knowledge with a wider audience, with the world! And I hope people see what we do here on a daily basis and say, “if they can do it, why can’t we?”. Food, something so central to life, to health and community building, should never be an afterthought. It is essential. For more information about our Department of Nourishment Arts, please contact Richard Humleker, Vice President of Development, at rhumleker@tcfd.org.